I have a thing for Hot Pot. 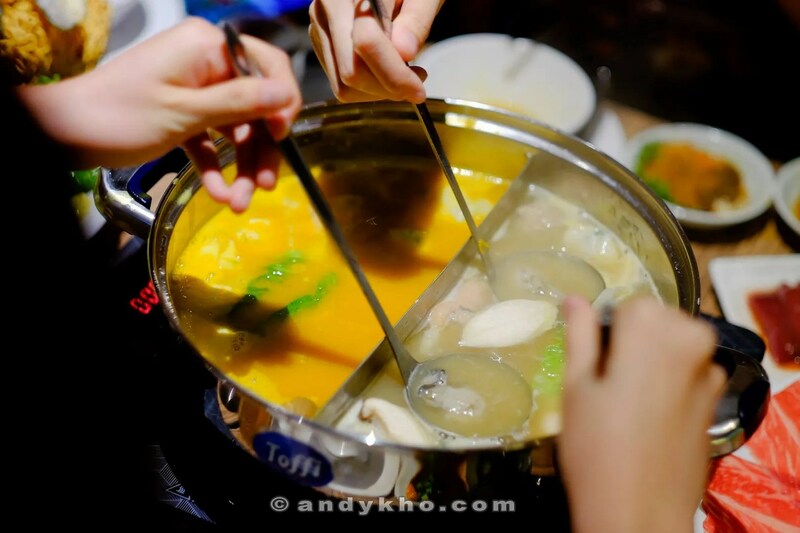 It’s the satisfaction of dunking fresh ingredients into boiling hot broth and then just enjoy the ingredients at its plainest state (well, with the help of some condiments), and it’s also a great way to bond. It goes without saying the ingredients need to be very fresh, and the broth needs to be wholesome enough to impart some flavour as well as providing a great base to a tasty soup at the end. 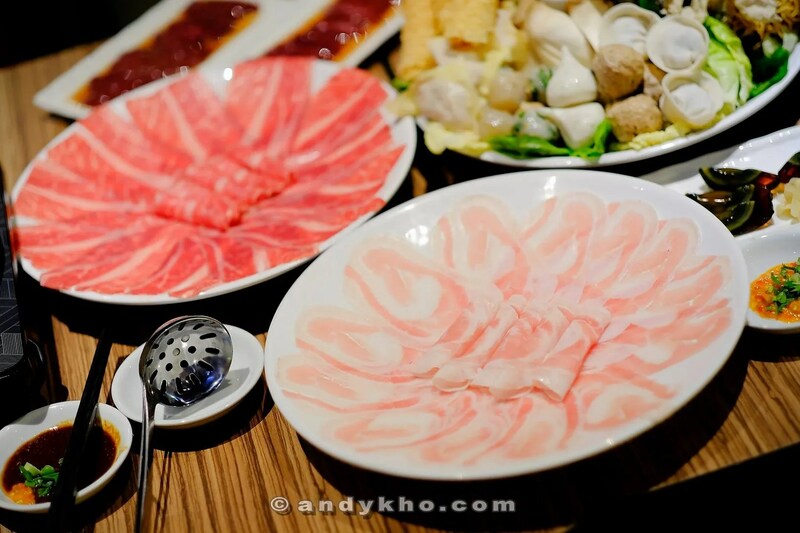 Therefore, we are always on the lookout for good Hot Pot places and I think I might have just found my favourite. 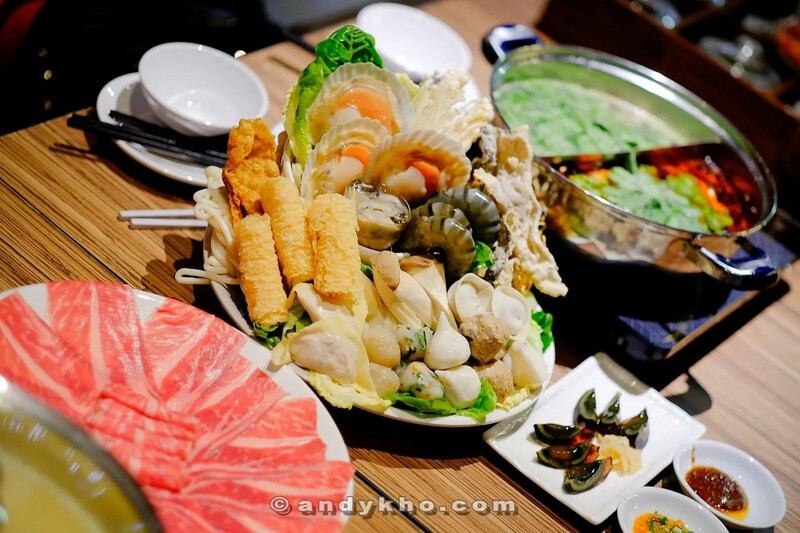 Introducing Hong Kong Hot Pot (香港热锅), a new kid on the block located at Telawi Square. 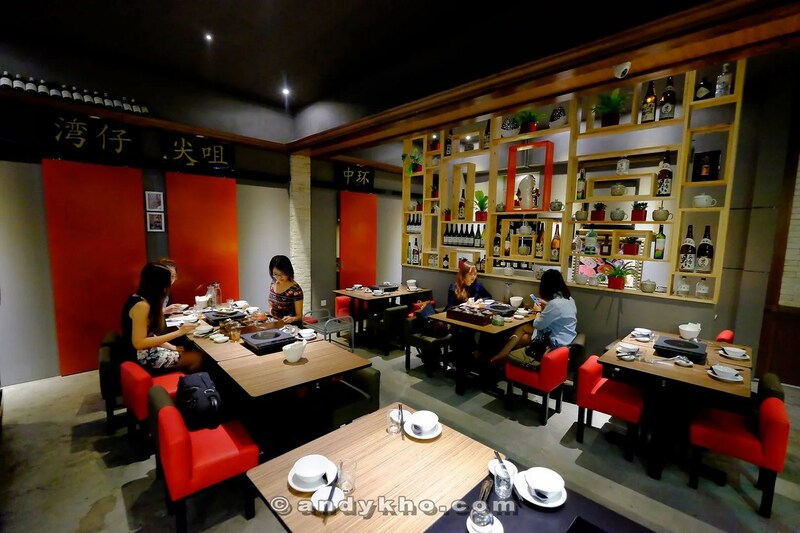 It’s only over a month old and it’s showing good potential to be a popular dining spot. 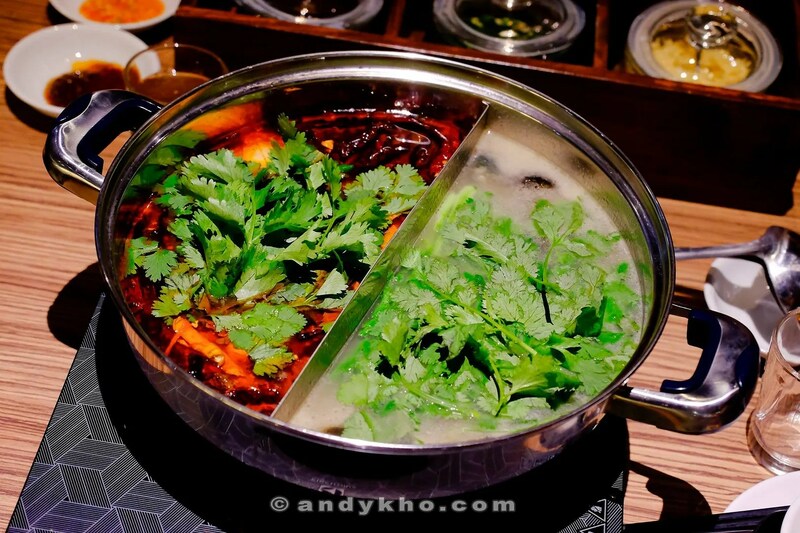 The concept, as you might guess, is Hong Kong style Hot Pot, featuring a lot of imported ingredients from Hong Kong and other countries to ensure only good quality stuff are served to their customers. One Friday evening, the girls from Malaysia Hottest Bloggers and I turned up for a feast, and a feast we did have! 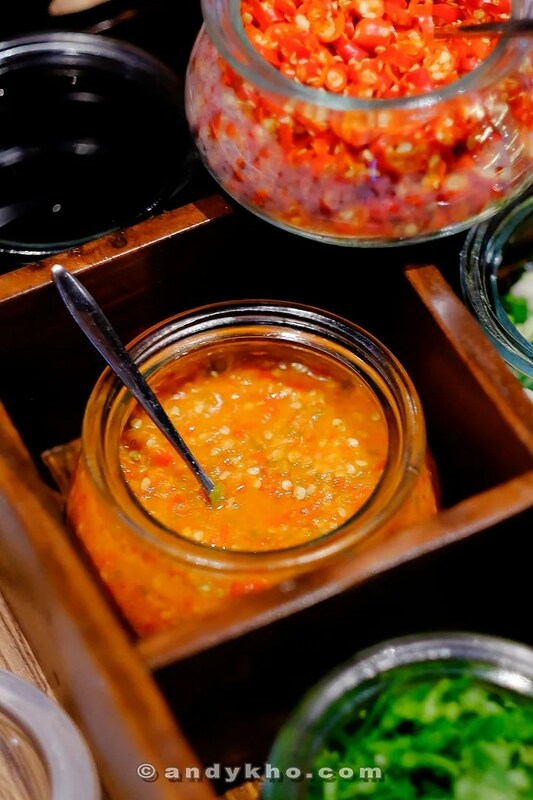 There are pots of coriander, soy sauce, freshly cut chili, raw garlic, spring onion, Sha Cha sauce (a popular Hot Pot condiment in Hong Kong/Taiwan/China, it’s basically the Chinese BBQ sauce), and homemade Chili which packs a punch. No prize guessing which is my favourite, of course. The Century Eggs here are from the famous Yong Kee Hong Kong. Served with ginger, it’s a lovely starter to the meal. I’m no century egg connoisseur but the see the little “snowflake” imprints on the egg “black”? 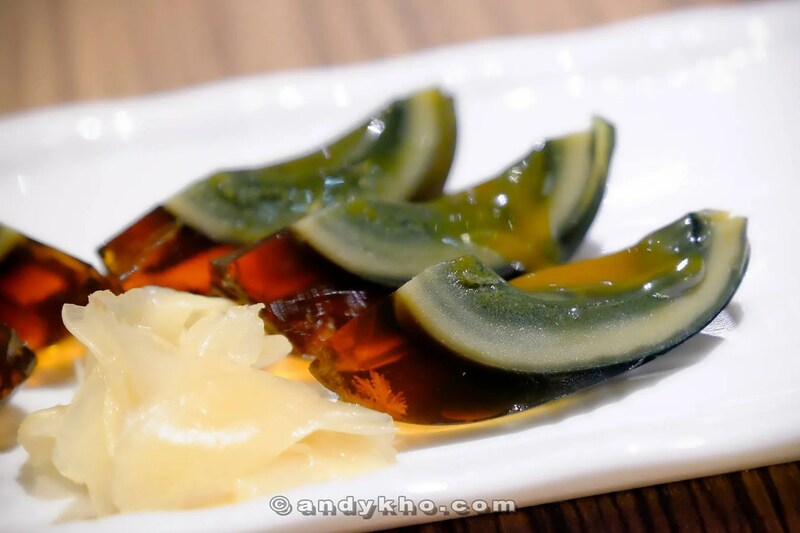 Supposed to be a marker of good century egg. To me, the flavours are good and I liked that the yolk is slightly runny in the centre but is not pungent at all. The soul of Hot Pot is of course the broth. We got to sample 4 different broths: Pumpkin, Sakura Pork Bone, Szechuan Spicy and Century Egg with Coriander. For a spice chaser, I’m surprised how much I like the original pork bone broth. 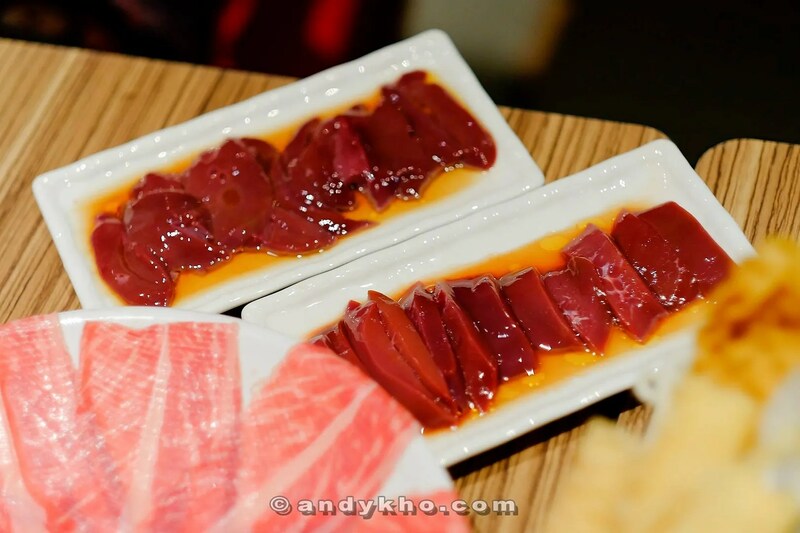 It has that natural sweetness of the pork and while it’s sufficiently seasoned, there’s no MSG used. It’s even delicious enough to slurp on its own. 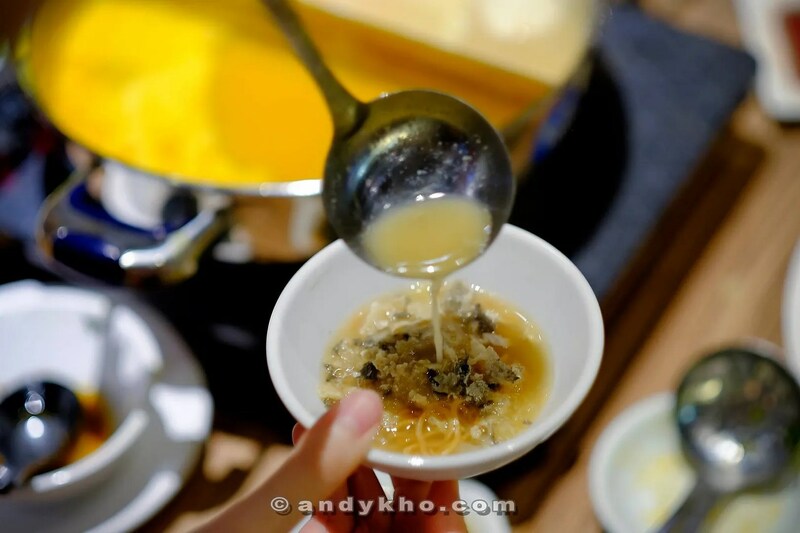 The pumpkin base is a good vegetarian alternative (then again who really eats JUST vegetables at Hot Pot? ), and it has a prominent ginger taste. Though I found it a little filling as it’s quite thick. The Century Egg/Coriander broth is something I’ve never tried before, though I don’t really detect the flavour of century egg as you can imagine, coriander can be quite overpowering. The Szechuan Spicy broth is quite mild in heat as compared to places like Xiao Fei Yang, but it’s tastier, thanks to the pork bone broth as base. So we eagerly sipped the home brewed Herbal Tea, which is a refreshing concoction of Watercress, Red dates, Chrysanthemum and Palm sugar and this awesome platter landed on our table. 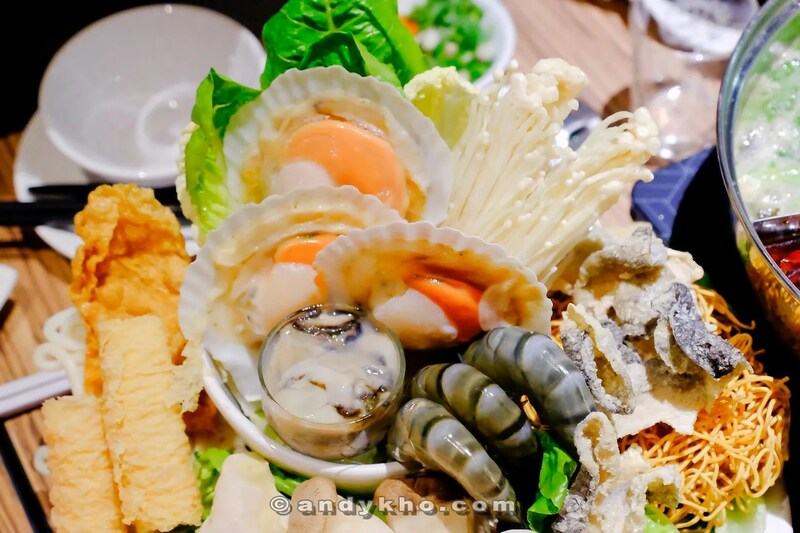 The platter is technically not on the menu but can be ordered and it’s RM68 per person. The portion you see in the pic is for 3. And that really is a lot of food. It includes: Japanese Half Shell Scallops, Korean Oysters, Fresh Tiger Prawns, Local Bean Curd Skin (Foo Chook), Bean Curd Roll (Imported from Hong Kong), Crispy Fish Skin (imported from Hong Kong), Homemade meat balls (Prawn balls, Squid Balls and Fish Balls), Imported meat balls (Mushroom Pork Balls, Crab Role Balls), Home made Chive Dumplings, Home made Prawn Dumplings, Enoki Mushrooms, King Oyster Mushrooms, Udon, Yee Mee, Premium Pork Slices, Premium Marbled Beef Slices, Liver slices (Pig), Kidney slices (pig). Of course, I zero-ed in on the Oysters. You can’t eat these raw, but don’t overcook it either to enjoy the tender flesh. On the far left are the Bean Curd Roll, which has a beautiful name in Chinese: 響零. You dip this in the broth for precisely 4 seconds. And far right, crispy fish skin which you only need to dip for one second to maintain maximum crisp. Look at the beautiful marbling on both the beef and pork. I can’t pick which one I like more. So give me both! The beautiful slices of Liver and Kidney I will not reject, in fact I was tempted to eat the liver raw! The liver should be slightly undercooked and slightly pink for the best texture, while the kidney needs a little more broth time. 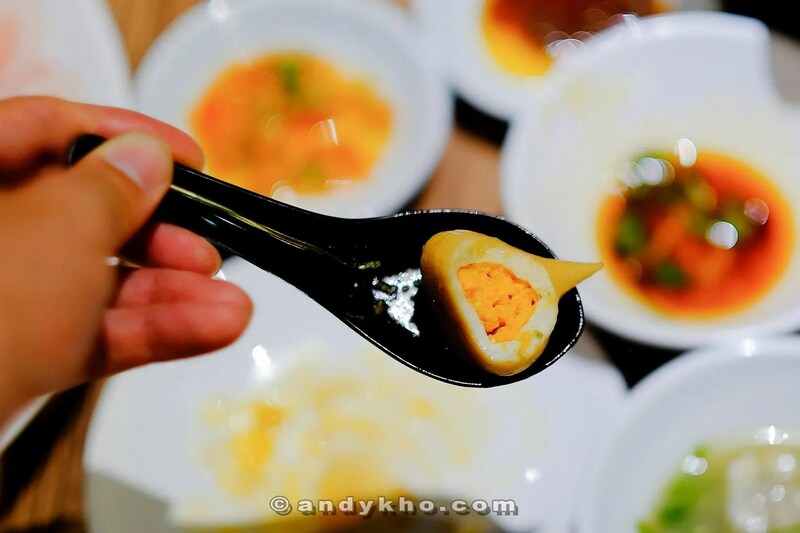 Here’s a special fish ball with roe as filling. Talk about a pleasant surprise. 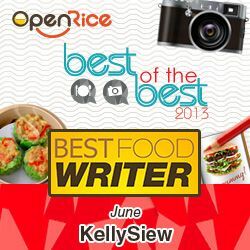 We were introduced to a special way of consuming the yee mee too. You first cook it until al dente, fish out the noodles, and sprinkle some crushed fish skin and bean curd sheet over, then pour in a little broth. Satisfying and comforting at the same time! I have to admit we probably overate that night, but it was one of the nicest review I’ve attended for a long time. Needless to say, I will be back, and soon. Jalan Telawi 3, Bangsar Baru, 59100 Kuala Lumpur. Love that jar of chili dip! Wow!!!! All those to go into the pot? Must be so very very nice. The soup tasted so nice at the end. Loved it. Best part of the hot pot!